The Tesla Model 3 is shaping up to be an amazing car, and pretty soon, there will be a ridiculous amount of them on the road. It’s not nearly as fancy as its predecessor the Model S, but as Tesla CEO Elon Musk said during Wednesday’s Tesla earnings call, there’s a very good reason for that: It lets Tesla’s re-tooled factory in Fremont, CA churn out Model 3s an astounding rate. “The Model 3 is really designed for manufacturing,” Musk said, saying that it lacked a lot of the “bells and whistles” earlier models had. For instance, the Model S and S both have two separate screens powered by two separate computers, while the Model 3 just has one. The Model S has three kilometers of wiring, while the upcoming car has just half that. That simplicity, along with a couple other important developments, will allow Tesla to drastically step up the scale of its manufacturing. Right now, the company makes about 50,000 Model S and X vehicles every year. It’s planning on making ten times as many cars in 2018 — with the Model 3 accounting for 250,000 of the new vehicles. The demand for the Model 3 is certainly there. We don’t know how many preorders there are right now — Musk isn’t revealing the current number because “people read too much into it” and he’s trying to “anti-sell” it. But considering there were almost 300,000 preorders way back in April right after the announcement of the Model 3, the number is probably pretty substantial, and Tesla is going to need to move fast to meet the demand. 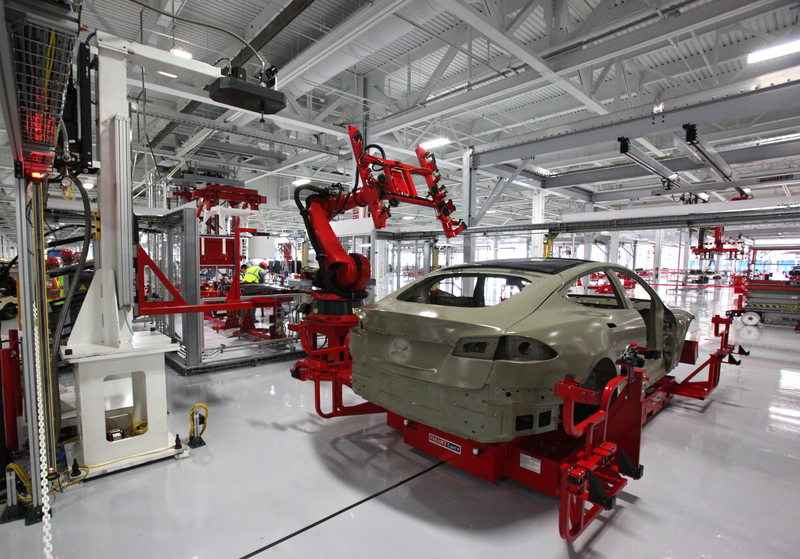 A Model S under construction. The Model 3 may have been designed with manufacturing in mind, but its simplicity isn’t the only part of the company’s plan to ramp up production. Tesla says it’s now able to partner with larger suppliers than it did while making earlier cars in its start-up days, and Musk touts the great strides he’s made in automating his company’s factories. “We have the Gigafactory, of course,” Musk noted, speaking of Tesla’s massive, highly efficient battery plant. “That’s a huge asset factory for powertrain, charges, and a few other things,” he added. The 4.9 million square foot factory is meant to quickly produce scores of lithium-ion batteries, and Tesla hopes to drive down the per kilowatt hour cost of its battery pack by over 30 percent. During the call, Musk said that he thinks Gigafactory 1 “can support probably one million vehicles a year,” though he expects to run into storage issues before anything else. The company is still planning on opening a second Gigafactory in Europe in the near future, however.